Before my stepson Paul’s recent wedding at Lake Tahoe in the high Sierras of Northern California, my husband Doug and I went on a treasure hunt in the foothills below. A vast amount of gold during the Gold Rush was extracted from this territory, and it is dotted with old mines and quaint towns from that era. But these days those hills are rich with gold of another order — wine. 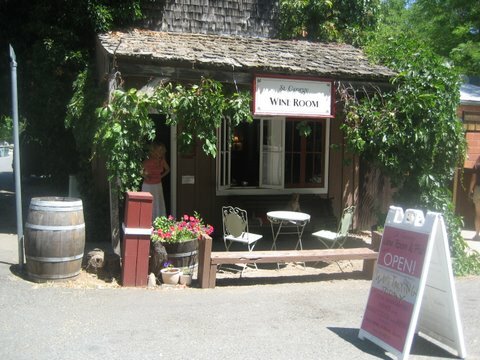 And our search for wedding wine brought us to the tiny town of Volcano in Amador County. Off windy, mountainous Hwy. 88, you have to be looking for Volcano to find it, and we were. We went there in part because of fond memories from my early years, when we made annual family Spring pilgrimages to eat sourdough pancakes in the old Jug and Rose Restaurant and to visit fabled Daffodil Hill three miles away; we also went there because of its reputation for being a center for great wine. And pulling into the St. George Wine & Pub, next door to the historic St. George Hotel, we were not disappointed. As we sat on barstools on an “historic” (read sloping) floor, we discovered some fine cabernets and zins, a lovely, light sauvignon blanc, a lyrical viogner. We also discovered other things for sale, such as hand-crafted furniture — and books. Owner Susan Purse began talking enthusiastically about Rankin Inlet, a novel by local writer Mara Feeney. With such a plug, naturally I bought the book, and our conversation turned to books. Turns out she and her husband, winemaker Dave Purse, love books and like selling them. So, along with purchasing some fine wine, I happily supplied them with copies of my novel, That Paris Year, along with some of James J. Patterson’s collection of essays, Bermuda Shorts, and they are our newest booksellers. Which goes to show bookstores are where you find them — or create them. And it is also another star in the cultural firmament for Volcano, which, despite its present population of about 85, claims to have had, among other things, the first theater group and the first lending library in the state. Now it can boast having the first wine bar/pub bookstore.